Background: Previous studies have indicated that morbidly obese males have decreased testosterone levels and sexual function related quality of life. Objective: The purpose of this study was to quantify decreased sexual quality of life in morbidly obese men using a previously validated questionnaire, to compare their reported sexual quality of life with that of a previously reported age-related normative sample of men and to examine the association between sexual quality of life and testosterone levels. Methods: Sixty-three morbidly obese men who were scheduled for bariatric surgery participated in this study. Serum testosterone levels and sexual quality of life were measured before any bariatric surgery performed. In order to evaluate sexual function, the previously validated Brief Male Sexual Function Inventory (BSFI) questionnaire was administered. The questionnaire has 11 questions measuring 5 different categories of sexual function including sexual drive (two questions), erectile function (three), ejaculatory function (two), problem assessment (three), and overall satisfaction (one). To assess the degree of decreased sexual quality of life in morbidly obese men, their baseline data were compared with age adjusted normative data from the literature. Pearson correlation coefficients were computed between BMI, free and total testosterone levels, and scores in each category of the BSFI questionnaire. Results: The mean age was 41.4 ± 11.2 yr, weight was 316.3 ± 43.8 lb, BMI was 45.2 ± 5.3 Kg/m2, free testosterone was 50.6 ± 21.3 pg/ml, and total testosterone was 288.2 ± 103.4 ng/dl. 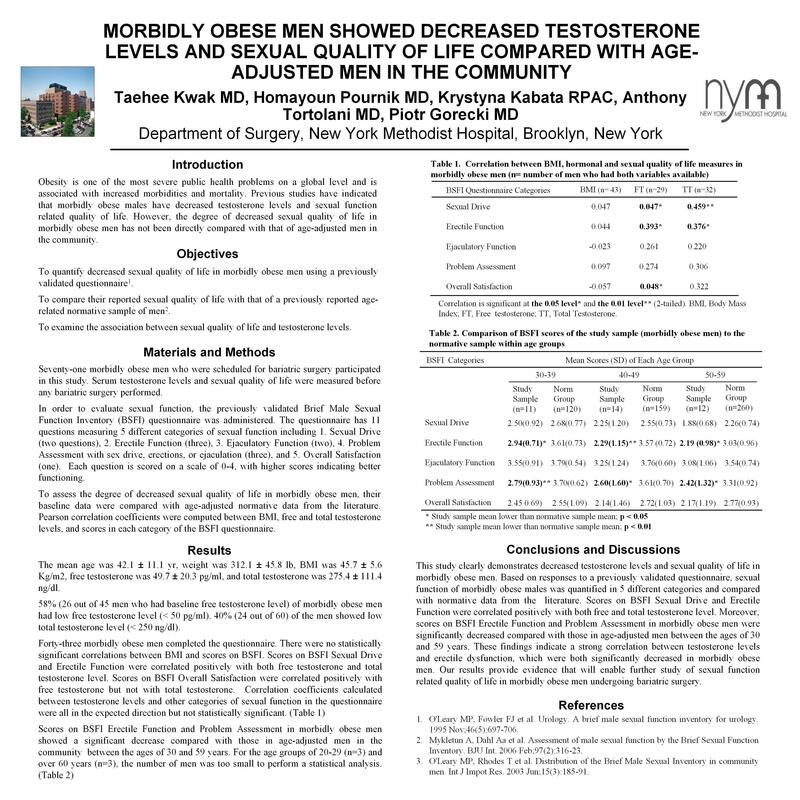 58% (23 out of 40 men who had baseline free testosterone level) of morbidly obese men had low free testosterone level (< 50 pg/ml). 38% (20 out of 54) of the men showed low total testosterone level (<250 ng/dl). There were no statistically significant correlations between BMI and scores on BSFI. Scores on BSFI Sexual Drive were correlated positively with both free testosterone and total testosterone level (r=0.58, p=0.02 and r=0.52, p=0.02 respectively). There was no significant correlation between testosterone levels and other categories of sexual function in the questionnaire. The percentage of morbidly obese men with at least one BSFI score below the normative mean for men in the same age group was as follows: 20-29 (70%); 30-39 (80%); 40-49 (80%); 50-59 (80%); 60 and older (40%). Conclusions: This study supports previous studies demonstrating decreased testosterone levels and sexual quality of life in morbidly obese men. Based on responses to a previously validated questionnaire, the vast majority of morbidly obese men, under the age of 60, indicated a level of sexual function below that of a large normative sample of men of similar age. Our results provide important evidence that will enable better understanding of sexual function related quality of life in morbidly obese men undergoing bariatric surgery.